Are cloth pads the best option? There is not a straightforward answer – it depends on various factors. What we know is that cloth pads, in order to be hygienic and not compromise health, must be properly washed in clean water and thoroughly dried. But we know this is not so easy right now in Kerala relief camps. So, in conclusion, if access to clean water for washing is available and there is space to dry the pads thoroughly, and ideally if there is someone involved with relief efforts on the ground who can assess this with women, then yes, cloth pads would be an ideal solution. For this reason, we are donating a bulk of foldable model pads (our fastest drying pads) as part of Auroville’s collective relief efforts along with clear instructions to those who will manage distribution to be alert to these important criteria to ensure safety, health and choice when distributing supplies. 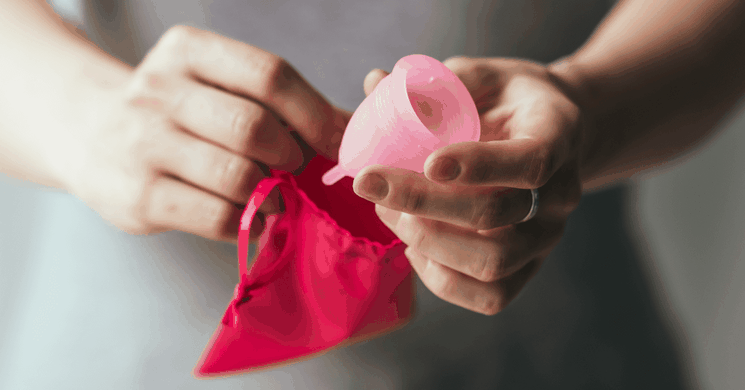 For women and girls who are willing and comfortable to use a menstrual cup, this is probably the best product to use because of the minimal need for water and space to manage cleaning. And like cloth pads, they will not add pollution to an environment which is already very vulnerable right now. 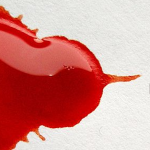 The important thing to be aware of here is that if a women has not previously used a menstrual cup, starting to use one right now if she has fear and is not comfortable with the idea of insertion could potentially add more stress and anxiety. Education and guidance/support on how to use a cup should be given to help women make this transition – especially when the options are really even less desirable. However, this product should not be forced on women who are not at ease with the idea. Disposable pads, especially commercially branded ones which are currently being used by an estimated 90% of women in Kerala, would seem to be the most convenient solution – the product is familiar and if available – it is effective. Yet we know of course that the problem with disposables is how to dispose of them and under the present circumstances in Kerala, plastic pollution will only add to the challenge of cleaning up, not to mention increased public health risks. Now, more than ever, if the use of disposable pads and diapers can be avoided, it will only help. If disposables are deemed necessary, then opting for ones that have a better compostable rating would be the best option. Take a look at brands like Aakar’s Anandi pads or Saathi pads to learn more. 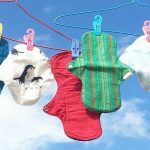 Finally, the use of disposable cloth similar to what Goonj use may well be the best solution if cloth pads or menstrual cups are not suitable for reasons mentioned earlier. 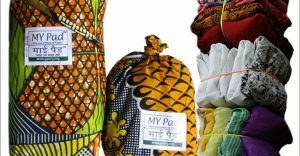 The Goonj pad is ideally suited to emergency situations as the cloth is clean and recycled – it can be burned or buried after a single use if necessary or if possible, washed and re-used a few times. The product is simple – a folded piece of clean cloth that encloses scraps of cotton fabric (offcuts) that form the absorbent core. As a non polluting makeshift product that requires minimal care, we think this is also one of the better solutions for women who will not be able to manage the care of cloth pads which are meant to be long lasting and need proper care or menstrual cups. To learn more about Goonj pads, have a look at this video. Goonj have also been actively raising funds and mobilizing resources to help relief efforts in Kerala. It is also of course possible for anyone to improvise and, like Goonj, recycle used clean cloth that is on hand. For example one can recycle an old cotton sari – firstly making sure it is washed with no starch present in it. If there is a border and the border is rough or has weave/design that is rough, remove the border. 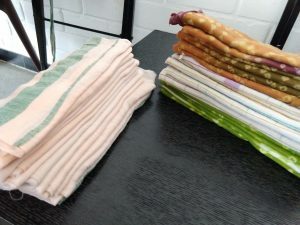 Alternatively old cotton towels are usually even more absorbent than saris. They can be cut into lengths that serve the need. Doing the right thing is always context specific! What is right at one time or for one person may not be for another. This article attempts to unpack some of the complexity of trying to navigate this important question and describes some of the pros and cons that influence different product choices and what makes them suitable or unsuitable at this time in Kerala. Thankfully, we live in a time when so many choices are available and providing the best product solution will happen when care is taken at the point of distribution to make sure care and hygiene factors are understood and conditions are conducive for this. As much as is humanly possible under the very difficult conditions, an attempt should be made to try and figure this out as far as distribution of sanitary supplies is concerned.